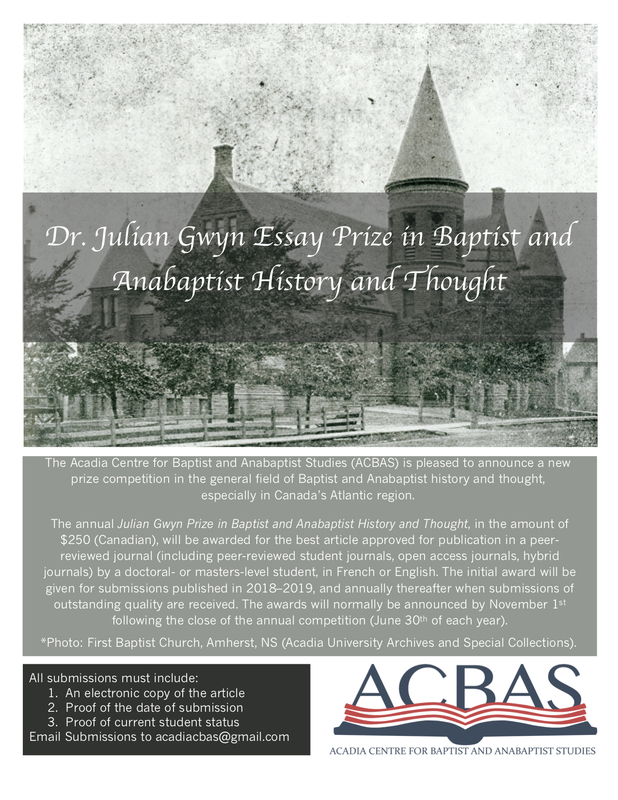 The Acadia Centre for Baptist and Anabaptist Studies (ACBAS) is pleased to announce the Julian Gwyn Essay Prize in Baptist and Anabaptist History and Thought. The details pertaining to this new essay prize can be found in the attached poster/advertisement. ACBAS is a joint venture between the Acadia Divinity College and Acadia University. This centre was established in 1991 and its primary goal is to facilitate and encourage studies in the fields of Baptist and Anabaptist History and Thought. For this reason, we are excited to announce this new essay prize. This entry was posted in News and tagged Acadia, Acadia Centre for Baptist and Anabaptist Studies, ACBAS, Anabaptist, Baptist, Baptist studies, Essay contest, History, Julian Gwyn, News, Nova Scotia. Bookmark the permalink. Visit the Canadian Baptist Archives, located at McMaster Divinity College! Contact cbarch@mcmaster.ca to learn more.